A new aspect of these games is the special Delta Episode. This part of the game tells of a story of an asteroid coming towards the planet with ties to things that happened 3000 years ago. It is said to tie together the mysteries of Mega Evolution and gives the history of Hoenn. This is done with the help of characters such as Steven and Wallace. This page contains major spoilers so don't read it unless you want to be spoiled. The game then starts in your house where Norman gives you a Pair of Tickets to the Mossdeep Star Show, suggesting you take your rival with you. Go outside and you meet the girl who was setting a new plan while disguised a grunt. Her name is Zinnia. She introduces herself and then leaves. Go to your rival's house and she will mention how a woman came in, attacked her and stole her Key Stone and is heading to Petalburg. When you get to Petalburg, you will find Courtney/Matt with Wally. They will want his Key Stone and then your Keystone and will challenge you. Defeat them and they will mention going to Meteor Falls for the Leader's Key Stone. Wally thanks you but notes that his Key Stone is gone as it is. 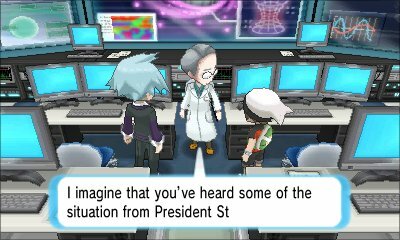 You then get a call on your PokéNav from Steven who asks you to meet him in Rustboro. Went to Rustboro and Steven was there with bad news that needs to be discussed. He tells the story of how 3000 years ago, talking about the war in Kalos that was stopped by a weapon made by AZ. Mr. Stone's Grandfather, using the story, created Infinity Energy using similar energy to the ones that weapon used. When you get to Mossdeep City, you will hand the Meteorite Shard over to Professor Cozmo as he explains the current plan. They intend to use the energy from Infinity Energy as well as energy from humans in Key Stones to power the rocket. It replicates the Energy from Mega Evolution and will fire the energy to create a warp hole to transport the meteoroid far away. They say this technology is similar to the teleporting portals that exist. The device that links the warp holes is a Link Cable. Go to Meteor Falls and go deep in it. There you will meet Steven and a lady who is a descendant of the ancient Draconids, an ancient people who pass down knowledge of Mega Evolution, and the lore of Lord Rayquaza, beginning of all. She explains that Hoenn has continually suffered disasters, and that the meteoroid is one that has happened on several occassions and the others are Primal Reversions awakening, and each time Rayquaza appeared to rescue. 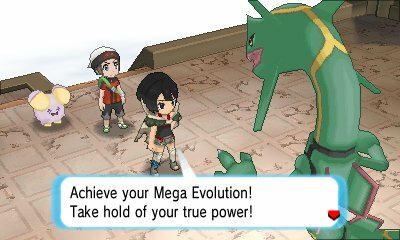 The leader of the Draconids went before a rainbow stone and made a wish which caused Rayquaza to change its body, essentially Mega Evolving. Mega Evolution was first discovered by the first meeting of humanity and Rayquaza. She explains that Zinnia is the Lorekeeper of the current generation. She explains how Zinnia tried to summon Rayquaza her own way by infiltrating an evil team and teaching them secrets to awaken the Primal Reversions to summon Rayquaza, and she is searching the world for Key Stones. Steven will leave and go to Rustboro City. 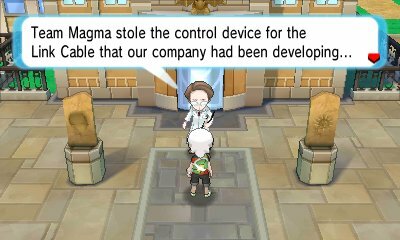 Go to Rustboro City and as you go to Devon Corp, you'll encounter a scientist being attacked by Team Magma/Aqua. Defeat the Grunt and another will come, and another. 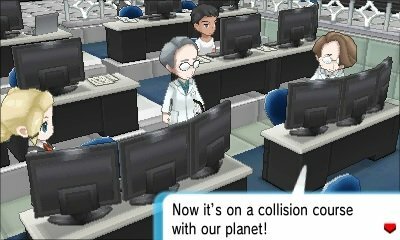 After they are defeated, the scientist informs you that Team Magma/Aqua have stolen the Link Cable and they are heading for the Mossdeep City Space Center. 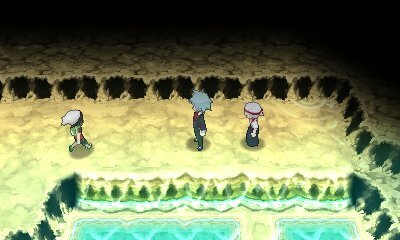 Go to the hideout and the grunts will say that Zinnia is too powerful but luckily their leader is deep in the base. You have to go through it again, battling various grunts. Reach the office and you'll see Zinnia facing off against Maxie/Archie and his admin Tabitha/Shelly. 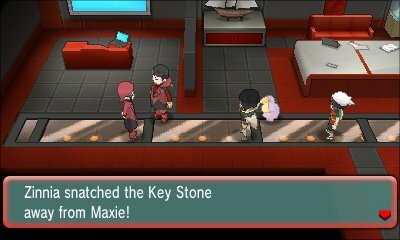 They have lost to Zinnia and Zinnia soon spots you and mentions you're the hero and here to save the world again, but saying you're too late, stealing Maxie/Archie's key stone and says that they can now summon Rayquaza and says that she hopes you can follow her. 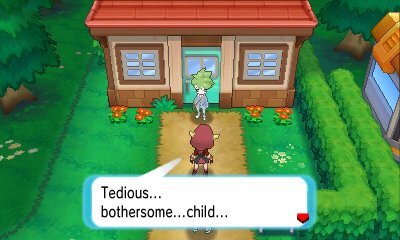 She leaves while Maxie/Archie gives you the Cameruptite/Sharpedoite respectively. Steven will then call and ask you to go to Mossdeep Space Center. When you enter the Sky Pillar, you will meet Zinnia once more. 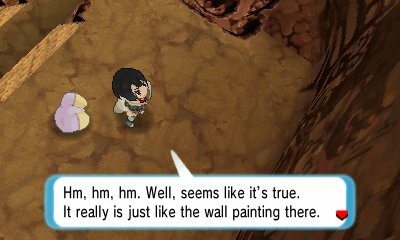 She will point out the paintings in the Sky Pillar are the tales passed down for thousands of years and she will pass it to us. Thousands of years ago, Primal Groudon & Primal Kyogre fought over the energy in endless clashes. Humanity could do nothing and had to watch as disaster swept over them. At that time, many meteoroids poured down from space and fell onto a waterfall that was home to a tribe of Dragon-type Pokémon users. Rayquaza confronted Primal Groudon & Kyogre and created a terrible wind that sapped their power, causing the two to vanish. It then flew high into the sky. A witness, a "tall visitor from a distant land", said "It is the Delta, born of the great disturbances in this world. By the bonds born of mankind's wish and the power of the stones, it will calm the troubles that plague the world." 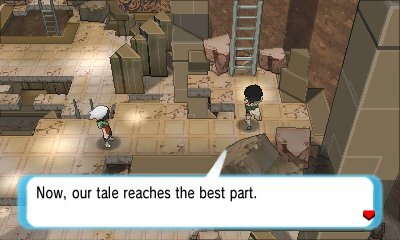 That was when the Draconids constructed the tower to hold the Rainbow Stone that granted Rayquaza the power and get closer to it. A thousand years of peace followed that time but learning of the history's cyclical nature, the Draconids foretold that the meteoroids would strike again, and the meteoroid to come will be greater than those that came before and could break the world forever. The Draconids created a plan again to awaken Rayquaza in order to protect the world. On the roof, Zinnia and her Whismur are watching the Meteor Shower at what they call the "Dragonhark altar" and are summoning Rayquaza to destroy the meteoroid. Zinnia mentions that she lost Aster, whom she named her Whismur after, and wishes to see her again. After the night, she asks you to take care of her Whismur if something happens to her and summons Rayquaza, however as she calls for the Mega Evolution, it doesn't work as her Key Stone doesn't react. Rayquaza has lost its power. Zinnia teaches it Dragon Ascent and challenges you to assess your worth as the protector. Once Zinnia is defeated, she says the task is on you to beat the Meteoroid. 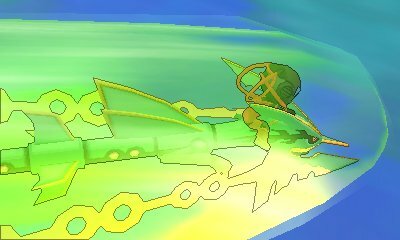 Donning the Magma/Aqua Suit, you climb on the Rayquaza and fly up to the sky. You watch a cinematic in space of you on Rayquaza destroying the meteorite. However, when the meteorite shatters, a black triangle remains and starts moving around. 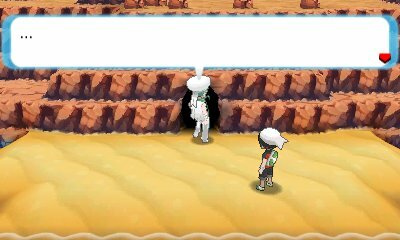 From it, Deoxys appears and instantly challenges you. Defeat or capture it and you'll return to Sky Pillar and Zinnia's Whismur will give you a letter with Zinna's farewells. Celebrations continue around Hoenn. Wally mentions getting his Key Stone back and getting a ticket to a place from Norman. 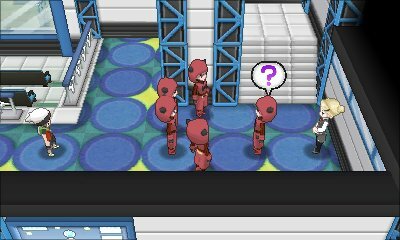 Team Magma reconcile and apologise, and intend to make a new beginning properly. 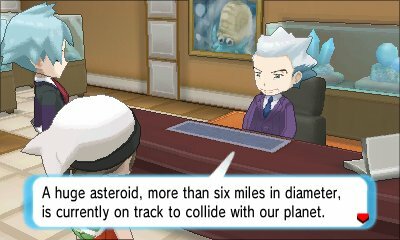 Steven mentions how he wants to travel the world and see the truths of people and Pokémon, but will stay for the time being and fulfil his duties at the Pokémon League, but offers Wallace the opportunity to be his successor. 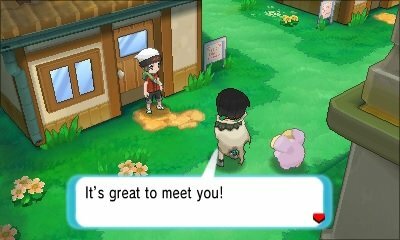 Zinnia meets her grandmother in Meteor Falls who exclaims it's time for Zinnia to rest to make a new beginning and Professor Birch, Norman and your mother discuss how happy you and your rival are. Now at Mossdeep, you and your rival are watching the meteorite shower and then return home.